Also offering tours for disabled clients. Licensed Tour Guide and Lecturer: English and Hebrew, guiding individuals, families and groups in Israel since 1983. Israel is like no other place you've ever visited. It's more than just a tourist stop; it's a place of heritage and history; a place of spirituality and connection. A place, if you will, that has too much history packed into too little space. As we tour together, you will visit places and speak of people you may have heard about in Sunday School or recent news reports. 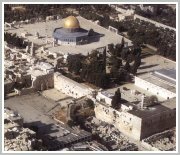 Israel is the place of the patriarchs, the prophets, King David, Solomon's temple, Jesus and his disciples, Mohammed's night journey, the Crusaders and Saladin, the Ottomans and the founders of the modern State of Israel after 2000 years of exile. It is the spiritual focus for Judaism, Christianity, Islam, the Druze and the Baha'i faiths. For many it is a place of pilgrimage; where the foundations of their faith were laid, where some of the history most central to their lives took place. Pick a place and pick a century - there's a story to be told that you won't find in the guidebooks. Today Israel is a place on the cutting edge of technology, and the threshold of peace. We are a little country with an amazing mixture of history, geography, habitats, flora and fauna, cultures and religions. Israel is less of a melting pot than a magnificent mosaic. Come and let me introduce you to the beauty of this magnificent mosaic, up close and personal. I look forward to developing a personalized itinerary for you and your family or group. After consultation with you, I will send you a proposed itinerary to review and share with your group. Then any additions or revisions can be incorporated to maximize your Israel experience. I can arrange for all of your transportation and lodging needs while you are here in Israel. It is also possible to include a wide variety of experiences including: rafting, jeeping, biking, rapelling, working on an archaeological dig, aerial touring (fixed wing or helicopter), mountaineering, etc. Excursions to archaeological, historic, religious and nature sites are an integral part of your visit. Eating in a wide variety of ethnic settings is also part of an Israel experience. I am very pleased to announce that I am now able to provide touring services with wheelchair/scooter lift vans from 3 people to 12 people including wheelchair users. Buses with lifts can also be arranged for up to 48 passengers. Itineraries and accessible hotel arrangements are tailored to your specific interests and needs.